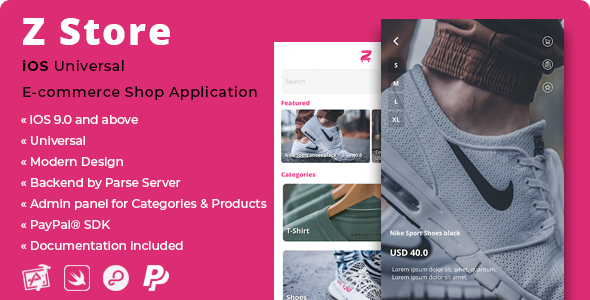 Z Store is a full-working Application for you to sell goods in mobility and get paid through PayPal. There’s also a Cash on delivery option. In both cases, you – as the Admin of the app – and the buyers will receive an order details email, so you’ll be able to know if a purchase has been already paid by PayPal or if the goods will be paid on delivery. This application has several features such as editing profile, posting and reading feedbacks, Braintree PayPal Checkout SDK, image gallery, full-screen product image, and much more. It’s backend is by Parse Server and it’s hosted on back4app – NO MySQL database involved. Parse Server is easy to use, flexible, reliable, open source, based on Node.js and well supported by a large community of developers. back4app is a great BaaS hosting website where you can configure your database and Facebook login features in just a few clicks. This template includes an extensive HTML Documentation file that explains how to configure the app’s features and database. If you want to use a nice Admin Panel to manage data of your database instead of using the Parse Dashboard, sign up for a FOREVER FREE account on Adminca.com and watch this video to see how to create a Panel for your Parse App. As per Envato Marketplace Terms, the Extended License applies to all applications that charge money to their users. In case your users will not be charged of money through your own version of this app, you can still buy it under a Regular license. Add In-App Purchase or any other Payment Gateway in the source code and publish the app for free on the App/Play Store – NOTE: If you want to publish your own version of this application for FREE only, then you can still buy it under a Regular License. Publish this application as a PAID app on the App Store. Transfer the live app of your own verison of this app on the App/Play Store to another owner by selling your ownership on flippa.com or similar marketplaces. So please compare your old files with those ones and perform changes. You can find those .framework files into the 'Parse' folder - it's into the project folder.